Questions | Melanie H. Scott, M.D. Should a woman be alarmed if she is asked to return for more evaluation after her yearly screening mammogram? No. Screening mammography is undertaken in asymptomatic women. Our goal in the screening situation is to find cancers that are not yet large enough or advanced enough to cause symptoms like lumps or skin retraction. Sometimes because of the small size of these cancers, they are not conspicuous and almost blend in with the normal breast tissue. Sometimes just slight differences in postioning or amount of compression can change the way the mammogram looks and seem to look like a mass or puckered area. It’s also important to keep in mind that benign conditions (like cysts) are much more common than cancer but require additional imaging to prove they are harmless. What does the return evaluation involve? The initial images from the screening exam will be reviewed by a radiologist, who will direct the additional imaging depending on the nature of the initial abnormality. There are radiologists who specialize in breast imaging who can tailor the evaluation to the question raised by the mammogram. The images are evaluated by the radiologist as they are obtained so that supplemental imaging can be performed at the same appointment. The goal of the work up is to confirm whether or not a true abnormality is present and to determine whether it is benign or suspicious. At the end of the appointment, you should receive your results. What kind of additional imaging might be utilized in the evaluation process? 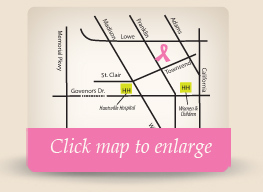 The most commonly used tools are additional specialized mammogram images and ultrasound. The additional mammogram pictures can be used to magnify small areas of calcifications or puckering so that we can see it better. They can also be used to spread out the breast tissue so that it no longer overlaps. This makes any underlying abnormality more conspicuous. Once we can see these abnormalities more clearly, it is possible to determine whether they are benign or suspicious. Ultrasound is most often used to evaluate masses. Ultrasound can confirm that a mass is benign, like a cyst or lymph node, better than a mammogram can. At comprehensive breast centers, more advanced tools are available such as MRI and the newest test BSGI which is a nuclear medicine test used to find breast cancer. If there is still a question after additional mammogram images and ultrasound have been performed, then these tests can be utilized. What if there really is something there? Certainly our hope is that all the abnormalities we find on a screening mammogram can be proven benign with additional imaging, but of course that is not always the case. We are after all looking for breast cancer and if it is there we want to find it before it has a chance to get worse. Fortunately even if there is something there that we can’t prove is benign, the odds are good (85%) that it really is benign, we just can’t prove it with imaging. When this happens (and it is a fairly common situation), a biopsy is recommended. Biopsies are usually done by taking a sample of the area with a needle using mammograms, ultrasound, MRI, or BSGI for guidance. 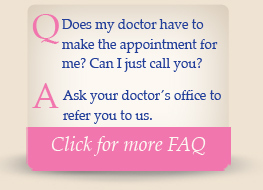 This can be done at a comprehensive breast center by a breast radiologist or by a surgeon. The samples are sent to the lab and analyzed under the microscope so that the final diagnosis is confirmed.